Mumbai: Promoters of Indian companies have been mopping up shares from the secondary market and subscribing to more than their entitled portion of rights issues of their own firms at substantial premiums, after foreign institutional investors (FIIs) turned heavy sellers this year. Some of the promoters want stock markets regulator Securities and Exchange Board of India (Sebi) to raise the limit on creeping acquisitions by promoters to 10-15% from 5% a year. Promoters of Bharti Airtel Ltd, Mahindra and Mahindra Ltd, Essar Oil Ltd, New Delhi Television Ltd, Phoenix Mills Ltd, Apollo Hospitals Enterprise Ltd, Dr Reddy’s Laboratories Ltd, Asian Paints Ltd, and Bajaj Holdings and Investments Ltd have been steadily acquiring shares in their own companies, while promoters of the Tata and Aditya Birla groups bought shares in their own rights issues. Many promoters had wooed foreign investors during the bull run in the markets in 2007, making presentations and arranging visits to their facilities, but have seen their stocks roiled by the unabated selling by FIIs this year. In the quarter ended September alone, FIIs sold about Rs18,900 crore worth of stocks, according to a 6 November report by domestic brokerage Kotak Securities Ltd.
That number has since increased. Sebi figures show that in October, FIIs sold Rs14,249 crore of equities. FIIs’ cumulative sales net of purchases since January (to date) is Rs51,009 crore, according to Sebi. 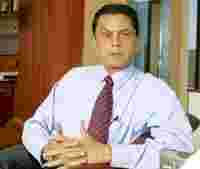 Arun Kumar Jagatramka, vice-chairman and managing director of the country’s largest metcoke manufacturer Gujarat NRE Coke Ltd, who is close to exhausting his limit to raise promoter stake by 5% in 2008-09, told analysts at a recent meet in Mumbai, “We would be happy without them (FIIs)." Jagatramka later played down the statement and said it was just a comment, and said he had been buying shares in the company up to the maximum permissible limit for the past three years. Mehul Choksi, who has also been buying into his own company Gitanjali Gems Ltd, India’s largest integrated diamond and jewellery manufacturer and retailer, said he appreciates the predicament of FIIs. “They (FIIs) have their issues like compulsory redemption pressure to handle," he said. Jagatramka and Choksi want Sebi to raise the annual creeping acquisition limit to 10-15%. “It makes sense to relax the limit," said Jagatramka, who has bought 4.78% in Gujarat NRE so far this financial year, with 3.5% of the stake bought in October. FIIs sold heavily in October, a month that saw the rights issues of Tata Motors Ltd and Hindalco Industries Ltd.
“The way the FIIs operate is historically known to all the promoters, and hence blaming them in a downturn does not make much sense," said Deepak Jasani, head of retail research at HDFC Securities Ltd. The volatility in stocks of companies where FIIs had a significant stake has also forced some promoters to wonder if the ownership limits for FIIs should be reduced. Jagatramka said any decision to lower the FII limit in his company would be a “collective decision", but added that they were no plans to do so. The FII holding in Gujarat NRE Coke is now below 24%. “In good times, everyone was clamouring for increasing the FII limit and attracting money from FIIs. If you don’t involve FIIs, you cannot expand your market cap beyond a certain point, as they typically buy in large droves," Jasani said. “If promoters are now talking of barring FIIs from their companies, it demonstrates a certain immaturity on their part, showing them as changing their minds from time to time, and effectively making FIIs the scapegoat in the entire turmoil." In late October, Sebi allowed promoters of companies to increase their stake up to 75% through the creeping acquisition route, without triggering an open offer. Earlier, this limit was capped at 55%. “(But) the maximum that a promoter can increase his stake in a year through this route still stands at 5%. The government should make an exemption on this or increase the limit, say for a period of 12-18 months, till the dust settles, for the new scheme to be meaningful," said Arun Kejriwal, a independent equity analyst based in Mumbai. Sebi’s move was a reaction to the torrent of sales by FIIs. Promoters buying shares from the market is also a confidence boosting measure aimed at investors. In the recent rights issue of Tata Motors, chairman Ratan Tata mirrored the action of his group’s holding company. He was among few individual shareholders to buy shares of Tata Motors Ltd from the market as well as subscribe to the rights issue, which was at a premium to the market price. Tata subscribed to 21,836 ordinary shares and 21,836 “A" ordinary shares in the rights issue at Rs340 apiece and Rs305, respectively, from his personal funds. Shares of Tata Motors traded at Rs244 on the last day of the rights issue.